Discover the group of diverse and important organisms know as native pollinators. Pollinators impact the lives of humans, animals, plants and other insects, making them a group which is critical to life as we know it. When the bees have completed their nesting period, place the habitat in an unheated garage or cold part of your basement, or simply move it to a more protected part of your garden. It's best to do this by mid summer and leave the nest undisturbed while the bees pupate. 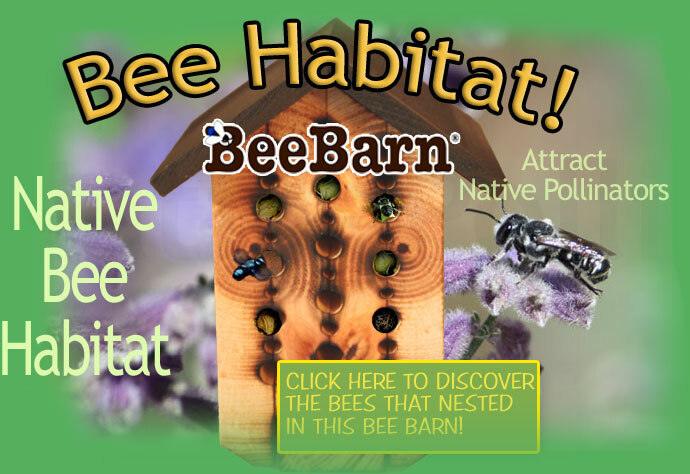 If you bring it into your basement or garage, be sure to place the habitat back outside before the bees emerge in late winter (before the earliest blossoming trees bloom). Like any habitat, bee nests need to be cleaned or replaced every few years. 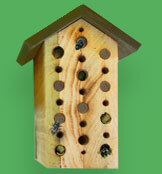 However, unlike bird houses, bee nests do not require cleaning every year. As adult bees emerge, possibly 8 to 10 bees per tunnel, holes are made clear enough for bees to renest directly in the same habitat. If you choose to clean rather than replace your bee habitat, it is important to make sure that all bees have emerged and none have renested before cleaning it. To do so still requires a second nesting habitat or the bees will look to nest elsewhere while the habitat is missing. Depending on how many bees you cultivate over the years, you may want to purchase larger habitat at each replacement or cleaning interval to continue increasing your garden pollinators. To evacuate a bee tunnel nesting habitat you may want to try orienting the habitat with the holes facing downward. Generally this is the opposite of the natural orientation of nesting into wood or earth and renesting may be discouraged. Another method is placing the habitat in a cardboard box with only a small hole for light and for bees to escape. Bees will not re-nest in habitat the carboard box. Once bees are evacuated from the habitat you can ream the holes with a wooden poker the size of a pencil or a bamboo skewer. A wire pipe cleaner can be useful to fully clear out the holes of various sizes. Finally, you can briefly emerse the habitat in water with a very small amount of bleach to sterilize the habitat. Let the habitat completely dry before re-introducing it to the bees. Optionally a small propane torch can be used to slightly burn (lightly toasted) the holes.